“What’s Your Email Address?” Don’t Answer That. As you may have seen in the news, email/password combinations for user accounts on other platforms﻿--including Sony’s PlayStation Network--have recently been released following ongoing attacks. To be clear, Second Life has not been targeted in attacks of this kind and your personal information remains secure with us. However, if you access Second Life using the same password from a platform that has been attacked, then your email address could be all that’s needed to take control of your Second Life account. Recently, we have seen people attempt to acquire Second Life users email addresses by posing as a Support agent, a Linden, a trusted member of a group, or someone that you know. We want to do everything possible to help you protect yourself from these attacks. Here are a few things that you should do right now to ensure that your personal information and your Second Life account remains safe and secure. Using your Second Life password on other platforms, such as forums, bank accounts, or email services, may put your account at risk if these other platforms are compromised. Change your Second Life password, as soon as possible, if this situation applies to you. Here are some good rules of thumb to create a secure password. No Linden or Support agent will ever make an unsolicited request for your personal information or password. Do not comply with any such requests, even if they are from an inworld friend or group member, and file an Abuse Report immediately. Finally, if you think that your account has been compromised, then please contact Support and we will help you to resolve the situation. As most of you are already aware, we are beta testing a new local payments system and we’ve hit a few bumps in the road. Again, we want to apologize for any inconvenience that this has caused for Residents using the beta system and we are here to help you get your issues resolved quickly. For those who have been affected, here is some information to help you get back up and running in Second Life. Last week, we introduced PayPal as a payment option to choose from. So, if you’re in the beta, and would like to use PayPal, then just go to the billing management page and click “Add PayPal.” Once that’s done, you can then choose to associate PayPal with a recurring payment on that page. If you have an outstanding balance, then we will process the payment (within a day), your account will be back in good standing, and your PayPal account will continue to be billed on a monthly basis, as expected. We have identified a small number of accounts that are nearing delinquency, or are delinquent, as a result of the known issues with the payments system beta. While we are working on the fix, we will switch those Residents back to the main payments system by 5pm PT on Monday, June 6. That should resolve your payment issues immediately, although you will lose the ability to pay in local currencies and other payment methods. The affected Residents will receive an email tomorrow and on Monday with more information. So, keep an eye out for emails from us and you can always call Customer Support at the 1-800 numbers provided in our previous blog post. Of all of the things that excite us about Second Life, and there are many, Mesh is near the top of our list. Since the Mesh Project Viewer has been available, many content creators have given it a try on the test grid and we have only seen a small glimpse of the unlimited creative potential that this technology brings to Second Life. On behalf of everyone at the Lab, we want to thank everyone who have participated in the test and created these cool videos demonstrating the power of Mesh. So, now that you are excited about trying it out on the Main Grid, we wanted to share the launch time line, as promised. In July, we will enable a limited set of regions to use Mesh and will roll it out, in a phased approach, throughout August. By the end of August, everyone in Second Life will be able to import Mesh objects. Of course, if we run into unforeseen issues or bugs, then this time line will need to shift. We know that you must have a lot of questions regarding policies, costs, and how Mesh objects will be weighted. Although we cannot share these details yet, we will continue to keep you informed on our progress and other relevant news on this blog. Search is a vital element in Second Life that enables you to find interesting people, places, events, items for sale, and other things to make your inworld experience more fun, collaborative, and meaningful. It has been a while since we last updated you on search and that’s because we’ve chosen to take a big leap forward versus smaller, incremental improvements. We believe that new search is a vast improvement over current search both in terms of usability and relevance. But we’re not the only ones who think that. We conducted a quiet test with a savvy group of Residents who preferred new search results over 75% of the time compared with current search results. Better Search Results User Interface: It’s not just prettier (we had to say it), but it’s also much more usable. Our new search engine considers Second Life specific data, such as how many people are at an event versus web-based data, so search results are more relevant and less subject to spam. And, now search results are compiled on a single scrollable page instead of several pages that require multiple clicks to see. You can even view multiple search results at one time by expanding results! Delivers More Relevant Results: The new search engine also serves more relevant results than the current search technology, based on four rounds of double-blind testing. And, we’ll always continue to test and tweak the results to ensure that you find what you’re looking for. To Buy or Rent? That is the Question. : The land sales category has been revamped, separating sales and rentals and giving you better options to limit your search by price range and land size. Now, it’s much easier to find that perfect place to settle in Second Life. Find Out What’s Happening Now: You can also search Events by either the exact start time or ”happening now,” but might have started earlier. That way, you can quickly find out what’s happening in Second Life right now. Search Results Are Saved: Many of you have shared with us how you use search to discover your world and shop, and how you want your search results saved. We’ve all had this experience. We search for something, find an interesting event or place to go shopping, and then want to go back to our search results and find another place to go--but they are gone. When using the new Search, results are saved for 15 minutes so that you can easily go back and explore other options. Take a look at this video and see for yourself. For those who want more details, the Search Project Viewer FAQ explains the test process and the search terms that landowners will need to use when listing their land for sale or rent. One of the first questions many will have is, “Will new search work in Viewer 1.23 and Third-Party Viewers?” New search will soon be available to you in the official SL Viewer and we will not be implementing it for the 1.23 Viewer. To be clear, you can still use the 1.23 Viewer, but search functionality will be impaired once new search is released into general availability, after the test period. (We cannot speak to which Third-Party Viewers will adopt the new search technology.) All of our development efforts are focused on making SL Viewer with Basic and Advanced modes exceptional for all Residents--new and seasoned. Trouble Logging In? Billing Issues? Call Our Support Team Toll-Free. Some recent issues with our billing system have caused some accounts to become delinquent and that has prevented those users from logging in to Second Life. We apologize to those who have been affected and for any inconvenience that this has caused. If you have had problems with our billing system, such as difficulty adding or updating your payment info or you are unable to login to Second Life, then we’re here to help. The best way to quickly get your billing issues resolved is to call our Billing Support team who is available 24 hours a day, 7 days a week. And, we’ve just created several new toll free numbers as an added convenience for our international customers. Please press option 3 to get to Billing Support. Or, if you would rather, you can always create a Support case and we’ll get to it as soon as possible. We’ve been very busy at the Lab since I last updated you in March when we launched the SL Viewer with Basic and Advanced modes. As BK mentioned today in the Q1 Economy Update blog post, we have seen a significant improvement in new and completed daily registrations when compared to recent months and an increase in new users exploring Second Life. It’s a solid first step and I wanted to take this opportunity to share some of the changes and improvements that we’ve implemented and a small look ahead. On the registration front, we’re knocking down the barriers that can sometimes prevent interested users from joining Second Life. If you haven’t checked out the Join experience lately, then you definitely should. New users start by picking an avatar in a dynamic, animated interface that immediately draws them in. We’ve also removed much of the non-essential information, that we used to require in the registration flow, to make it a quicker and more delightful on-boarding experience. We’re going to continue to refine and evolve this experience, but it is a big contributor to the 33% growth in new registrations. When we first launched Basic mode, we started with a basic set of human avatars that helped get new Residents immersed in Second Life without having to worry about configuring their avatar to socialize and find cool things to do, in the integrated Destination Guide. But, we know that the beauty of Second Life is the diversity and richness of how we choose to represent ourselves inworld. So, we’re adding 12 animal and 12 Robots and soon we’ll have Vehicles too. Then, we’ll also commission another set of human avatars that represent a wider, more diverse audience. Have You Noticed the New Dynamic Login Screen? If you use the SL Viewer, then you might have noticed a change this week. The login screen is one of the most important pieces of real estate that we have to communicate with you. To start, we’ve added announcements and the blog feed. In the future, you’ll see more feeds on that page--like cool things in SL going on right now, highlights from the Destination Guide, and more. So, next time you log in, take a moment to check out the new feeds before you enter SL because you might find some new places to explore or learn about new features or initiatives going on at the Lab. Thank you to all our Residents who suggested this. For those who might be unfamiliar with the program that began a few years ago, the RHN is a grouping of communities dedicated to helping new users get acclimated to Second Life. The RHN includes over 15,000 volunteers from the following organizations: Help Sandbox, Hobo Helpers, Mental Mentors, New Citizens, Inc., Phoenix Wave Mentors, Second Ability Mentors, Virtual Ability, and the White Tiger Mentors. The program has been in a bit of a holding pattern on the Linden side, while each of these groups continued to do their good work. I’m happy to report that we’re officially bringing back the RHN network and look forward to partnering with these communities and integrating them more tightly into our new user experience. For those who are wondering why I haven’t mentioned our initiatives on fixing lag, and other updates from the technology side of the house, FJ and Bagman will be updating you on those items next week. In the meantime, thanks to all of you for your continued support! Over the past few weeks, I have explored cyberspaces, flown aircraft, gone sailing, attended music concerts, made a battleship, attended charity events, and met some wonderful people all within Second Life. I hope to see many of our Residents old and new inworld soon! Efforts to improve operating focus and cost structure have resulted in two consecutive quarters of strong cash flow and profitability with Q1 2011 the most successful in Linden Lab’s history. Regarding Customer Support, we made some changes late last year that unfortunately impacted Residents with longer resolution times. Over the last few months, we have worked through the backlog and have returned to 24- to 48-hour resolution times for nearly all types of issues. We continue to add resources and adjust processes to further improve resolution times and customer satisfaction, especially for more complex issues. 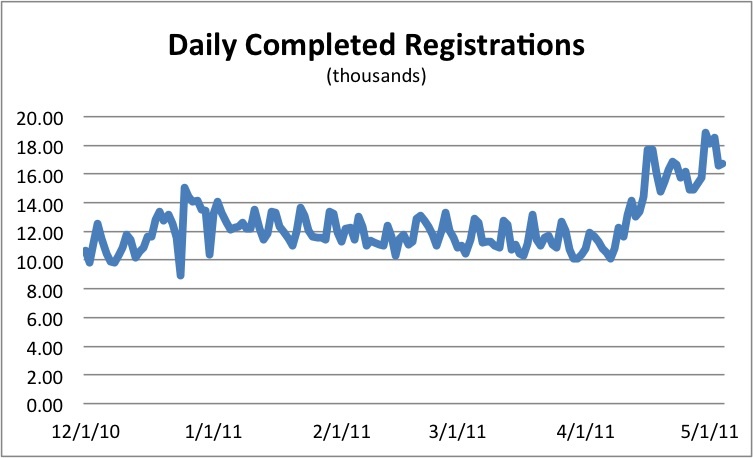 After launching the new SL Viewer with Basic and Advanced modes in late Q1 2011, and improving the new user registration experience in early Q2 2011, we have seen over 33% improvement in new daily completed registrations when compared to recent months. This is an early indicator that usability improvements are having an initial positive impact with more significant ones still to be delivered over the coming weeks and months. In Q1 2011, measures of the size and strength of the Second Life Linden Dollar economy improved slightly while users, usage and world size were consistent with the last few quarters. For a definition of the metrics in this charts below, please see this wiki page. Click on each image below to see a larger version. There has been a positive trend since the new registration experience was introduced on April 11. Average monthly repeat logins have been virtually unchanged over the previous 3 quarters. Similarly, user hours have remained consistent over the last 3 quarters. The value of the Linden dollar has continued to improve from Q4 2010 and is at its highest level in the last 6 quarters. *Note that the exchange rate is expressed in L$/USD, meaning larger numbers represent a lower L$ value and smaller numbers represent a higher L$ value. The average rate is calculated by dividing the total L$ exchanged through the LindeX by the total US$ exchanged through the LindeX in the quarter. The US dollar value of Linden dollars held by Residents of Second Life has increased for the third consecutive quarter. 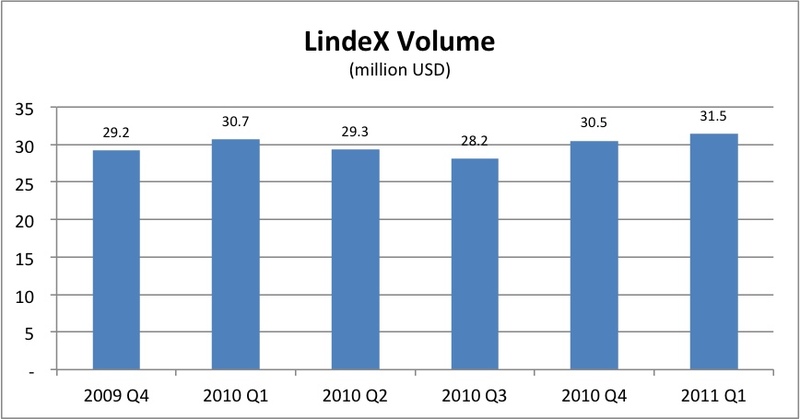 In Q1 2011, the LindeX Volume was at its highest level in the last 6 quarters. World size has also stayed within a 1% range over the last 3 quarters. We recently began beta testing a new system that enables our international customers to use local currencies and other local payment methods when purchasing Linden dollars and conducting other financial transactions with Linden Lab. We want to make it easier, and less expensive, for our international customers to shop and do business in Second Life. After all, wouldn’t it be nice to use your own currency, or PayPal, to purchase Linden dollars and also save money on fees? We think so too. Based on our beta testing to date, we’ve learned a lot and discovered a few issues that we want to change and improve. So, I wanted to share our progress and what to expect as we roll this capability out to all international users later this year. Recent Billing Issues Will Not Affect Your Account Status: For those that have run into billing glitches, let me put your mind at ease. Some international customers have tried to pay us (to keep their account current) and they were unable to complete the transaction. If you’ve encountered this problem, then please accept our apologies. Rest assured that everyone who was not able to provide payments, due to this system issue, have already had their accounts manually restored as we work to implement a fix. The affected accounts are still in good standing and these customers will not lose their status or land as a consequence. Local Payments Will be Available in all Supported Viewers: Another concern that has been raised by the community is whether users can purchase Linden dollars using local currencies in Viewer 1.23. The answer is yes, although some people using Viewer 1.23 may have run into issues purchasing Linden dollars a few weeks ago. The issue has since been fixed. Now, customers who are in this beta can purchase Linden dollars using all supported Viewers. We Need to Make the Local Payments System Easier to Use: On the usability side, we have beta tested local payments with new and current international customers and we’ve found we need some additional usability work to ensure that purchasing Linden dollars (and other transactions) is an easier, intuitive experience. While we are doing that, we will not add any new or current Residents to the beta system instead they will stay on the standard payments system. But if you have already been using the local payments beta version, then you will continue to do so while we continue getting ready for a wider roll out. In late July, we’ll be ready to provide all of our international customers with comprehensive local payment options in a system that works seamlessly and is easy to use. I’ll be updating you again as we get closer to releasing the system. Thanks for you patience as we work out the kinks. And, if you have additional questions about the system, then there’s a comprehensive Local Payments article with a Help and Frequently Asked Questions (including how to contact Support) in English, Français, Deutsch, Español, Italiano, Português, and 日本語. Note: This blog post is also available in Français, Deutsch, Español, Italiano, Português, and 日本語. Introducing Dash Deals on the SL Marketplace! Everyone loves a great deal, right? So, we’re introducing a new test program called “Dash Deals.” During this test, we will be running one Dash Deal per week, for the next five weeks. Dash Deals will provide Second Life Marketplace shoppers with the opportunity to purchase a specific virtual item for 24 hours at a 50% discount or more. Hand-picked by the Linden team from Merchant submissions, these products highlight the creativity and variety of products available to Marketplace shoppers. We hope that you enjoy our selections and take advantage of the deals! And, if the test goes well, then you can expect to see more Dash Deals beyond the test period. We’ll alert Second Life shoppers when the Dash Deal is available on Facebook, Twitter, and in a weekly email. Just click on the SL Marketplace link provided, take a look at the Dash Deal item, and snap it up while it’s still available. Today’s Dash Deal is an alluring couture gown offered at L$440 (originally L$880). But hurry—this deal only lasts for 24 hours! 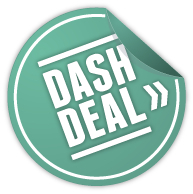 Keep an eye out on Facebook and Twitter for the official “Dash Deal” badge—and you could score a deep discount on some of the best virtual goods on Marketplace. Happy shopping! There have been some additional questions regarding the Dash Deal emails, and we wanted to take this opportunity to clarify a few points. Although Dash Deals last for a day, they will only happen once a week for the next 4 weeks. For those who don't want to receive weekly Dash Deal emails, just "unsubscribe" using the link in the email. However, this will mean that you are unsubscribing from all optional Second Life emails. I hope that this clarification is helpful and get ready for the next Dash Deal, scheduled for April 27, 2011. We have decided to discontinue the Dash Deal program. This decision was not made lightly and is due to several factors, including technical limitations which made the management of the program inefficient. We expect to test other programs of this type in the future, once we have resolved these issues. I want to thank everyone who downloaded the SL Viewer Beta with Basic and Advanced modes, gave it a try, and shared feedback with us. Since the initial launch last week, we’ve also deployed an additional beta version with fewer bugs and more stability and performance improvements. Today, we are releasing the SL Viewer into general availability and it is now the default download for new users. A few new features that are included are the destinations guide which allows rapid access to selected areas around SL for new users by interest, the ability to change avatars quickly and “click to walk.” Just click on a point ahead of you and your avatar will automatically start walking there. Additionally, we encourage you to fill in your “Interests” in the Edit Profile tab of your Profile page. Eventually, you’ll see that we are going to do some fun things with Interests once more people fill them in. Keep in mind, that we’re just at the beginning of developing the Basic experience for new customers and that we will continue to improve it, and add features, as time goes on. An important step in this process is to get new users trying the software. With a simplified user experience, we should see an increase in new customers staying in Second Life to explore, make friends, and find interesting things to do. And, ultimately, the more customers in Second Life, the better for everyone. Once a new user is acclimated to Second Life, and has learned some basic inworld skills, then they may want to switch to Advanced mode to use voice, purchase virtual goods, join groups, and create content. We look forward to working with you to help make our world grow. I recently joined Linden Lab as the new VP of Engineering to lead the Linden engineering team and improve the Second Life experience for both new and existing Residents. Second Life is not only the most unique product that I have ever seen, but it also has the most unique and challenging technical hurdles. When the opportunity came up for me to join the Linden team, the two aspects that excited me most were: 1) knowing that, with my experience, I could improve the product in significant ways, and 2) a belief that Second Life is not at the end of its life cycle, but rather has its best years ahead of it. For me, the challenges and the opportunities at the Lab are a perfect fit for my background. I come to the Lab with over 20 years of experience as a game developer and engineering lead, primarily in the MMO area. Prior to joining Linden Lab, I spent 10 years working for Sony Online Entertainment doing MMO RPG development (with a focus on the networking, servers, and core technologies), along with PS3 and PSP development. Some of the titles that I worked on include: Everquest, Everquest II, Star Wars Galaxies, Planetside, Untold Legends PS3, Field Commander PSP, FreeRealms, and CloneWars Adventures. Old timers may remember an early entry into MMO gaming that I developed in a game called Subspace, published by Virgin Interactive Entertainment in 1996. The unique relationship I had with the player base of this product mirrors the relationship between the Lindens and the Residents in many ways. If there is one thing I've learned about MMO gaming over the years it is that MMO products have a life of their own, and the player investment in the product is a key aspect of that. Second Life is no different in this regard. The Residents of Second Life want to see the product succeed every bit as much as Linden Lab does. I describe myself primarily as a hard-core C++ developer, with a passion for well-architected, highly optimized systems. I like taking on the big challenges and enjoy refactoring systems to make substantial improvements, rather than just make smaller, incremental improvements. link to the game in action (brings back good memories). Excited to be on board and looking forward to an amazing 2011 and beyond. Service: We have added significant resources to better address customer service times. Many of you will have noticed that our response times have improved both for individual cases and larger community issues. In addition, we are actively working to reduce commerce friction. We will continue to work hard to work out the kinks and improve these services even further. Lag: We have already implemented some server-side performance enhancements to improve lag and there will be far greater focus on that area in the months to come. Usability: This is the topic of today’s post. Many of you have noted that Second Life is difficult to use, both for yourself and when inviting friends inworld. This usability issue is more complex than the user interface as it not only includes finding people and places, but it is also is dependent on some of the items above. We want to make an experience that helps you overcome some of the big usability hurdles that you’ve shared with me. Today, we’re launching a new version of Second Life Viewer Beta which introduces two modes that are available to everyone who downloads it--Basic and Advanced. Basic mode is an easier, simplified experience designed to introduce users to Second Life. It includes simple communication and navigation tools such as click to move and hold to move the camera, a choice of 24 pre-configured avatars, and an integrated Destination Guide to help you connect to friends and interesting places quickly and easily. Certain functionality, such as voice capability, building tools, and the ability to purchase virtual goods, is not available in Basic mode. Advanced mode is for those already familiar with Second Life who use the full feature set of the SL Viewer. There are a couple of things that I want to share right off the bat. First, both Basic and Advanced modes are built on the same code base and are included in the standard download of the SL Viewer Beta. You can think of it like two skins on the same piece of software. New customers will default to Basic, and if you already have the SL Viewer loaded onto your machine, the new version will default to the Advanced mode. Our goal is to get new users comfortable in SL using Basic mode and then have the option to toggle to the Advanced mode when they are ready to conduct more advanced activities such as using voice, purchasing virtual goods, and building. And, it’s easy to switch back and forth. Simply toggle to the alternate mode in the Login Screen, and then log back in. Lastly, we know that the Basic mode is very lean, and we’re only at the beginning of developing the minimum feature set--keeping it simple and working on the basics of usability first. We anticipate adding additional capabilities to Basic mode, so your feedback is important before we make this version of the SL Viewer the default download for new users. This is a first small step towards making the world that you have created more accessible and enjoyable to use for everyone. So, download the SL Viewer Beta and try it out. Our thoughts today are with all of those who are suffering in the devastation caused by the earthquakes in Japan and the tsunami in the Pacific. We encourage all Second Life Residents to support the relief efforts however they can, and we would like to help. We have created two special Linden Bears--one that is wearable and one that sits--which are now for sale in the Marketplace at several pricing levels: L$300, L$1,000 and L$3,000. Here’s the direct link to purchase them. We will donate all proceeds from sales of this bear to the Japan Earthquake and Pacific Tsunami Relief efforts of the American Red Cross. Please help us to support the relief efforts - buy the bears, and help spread the word in Second Life. Additionally, we know that independent groups in Second Life are also planning to support relief efforts. For example, Radar Magazine in Second Life will be holding a month-long event and are seeking designers to donate virtual items (see this article for details). If your group is planning an inworld relief effort, then please share it in the comments here. 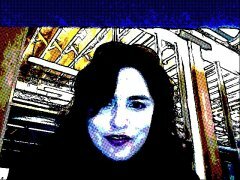 UPDATE -- April 14, 2011: Thank you to everyone who contributed to this campaign! In total, this doation drive raised more than L$8.3 million. Today, we are pleased to launch the new, and much improved, Second Life Community website. The new platform integrates Blogs, Forums, Answers, and the Knowledge Base into one powerful integrated system that enables you to more efficiently leverage the power and knowledge of the community. We have also redesigned the Customer Support Portal around this platform to make it easy to find the most relevant answers to your technical support and customer service questions online or to contact us when your issues are more complex. Take a look at this video to get an overview of the many benefits that the new platform offers. Unified Search: You can find the information that you’re looking for in one federated search field that returns organized results from relevant content in the Forums, Blogs, Answers, and the Knowledge Base. Single Sign On: You do not need to be logged in to read the community content, but you do need to be logged in to contribute. Just use your normal Second Life username and password to login. Share Blog Posts and Knowledge Base Articles: If you find an interesting blog post or Knowledge Base article, then you can now share that information on Facebook, Twitter, and other social networks. Other kinds of content, such as user-generated comments, Forum posts, etc., will not have this functionality available. 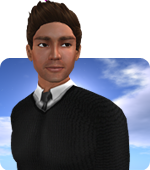 Contribution-Based Roles: You will notice that each person in Second Life has a role, or rank, based on his or her contributions to the platform. The roles start at Resident and go up to Helper and with each rank comes more capabilities. So, keep those contributions coming and watch your community platform ranking rise. A Smarter SL Answers: Try out the new Answers section. You’ll immediately notice that when you type a keyword, an intuitive category search will return common matching solution results. And, solutions accepted by the question author are automatically nominated for Linden editorial review and possible inclusion in the Knowledge Base. Please Resubscribe to RSS Feeds: If you had an RSS feed on the old blogs or forums, then you will need to resubscribe to the RSS feeds that interest you in the new system. We apologize for the inconvenience. FAQs Help You Get Acclimated: We have created a detailed Frequently Asked Questions area for each section of the new system that will get you up and running in no time. Yes, Archives Are Still Available: We preloaded Answered questions, Blogs, Forums, and the Knowledge Base with recent posts and/or solutions to get the conversations started. However, if you want to find older content that was available in the old platform, then you can still access it through search in read-only format. Thanks for your patience as we transitioned to the new system. Start exploring, contributing, and let us know what you think. As is always the case with new systems, you may run into bugs. If you do, then log them on JIRA. And, if you have general feedback on the community platform, then share it with is in the Feedback section of the Forums. As I mentioned last week, today the Second Life Forums, Blogs, Knowledge Base and SL Answers are now temporarily in read-only mode. This means that everything housed within the http://blogs.secondlife.com site is available for you to read, but you cannot post comments--or contribute content--until we launch our new community platform (http://community.secondlife.com) on March 2nd. Get ready for a more robust self-help platform with powerful capabilities, including unified search, reputation systems, new community tools, and social media features. And, please pardon our dust while we transition over to the new system. To be informed immediately when the new community platform is live, follow us at @Second Life on Twitter where we’ll be officially announcing the launch. I wanted to give you an update on several important new Customer and Community Support initiatives currently underway. We have recently added significant resources--of both people and technology--to improve your experience with both Customer Support and community interaction and communication. On the Customer Support front, we have increased coverage to eliminate our backlog within the next 3 weeks and have already resolved 70% of the outstanding tickets. We are also continuing to work on changes to our Support processes and policies to improve communication about cases and speed up resolution time. Additionally, we are actively investing in technologies that help you to quickly solve problems, find answers, share insights, and get help from the community. Robust Self-Help Functionality: It will be easier and faster to find the answer to your question or the information that you’re looking for. For example, in Answers, when you begin to type a keyword, an intuitive category search will return common matching solution results. And, solutions accepted by the question author are automatically nominated for Linden editorial review and possible inclusion in the Knowledge Base. Single Sign On: Just as you can in the current system today, you will use your current Second Life username and password to log in to the new platform. Contribution-Based Roles: Based on your contributions to the platform, you will be able to earn new capabilities and roles in the community--from a brand new Resident to seasoned and experienced Helper. Easier for Experienced Residents to Share Their Wisdom: If you’re an avid Second Life Resident who wants to participate in the community, then it will be much easier for you to update existing articles; comment on published articles; and nominate, review, and include subject matter for the Knowledge Base. Industry-Standard Social Media Features: As you can in many other community platforms, with the click of the mouse, it will be easy to Twitter, Facebook, Digg, etc., interesting content that you want to share with your friends in the Social Web. The Resident testers who were given a sneak peek into the system gave us great feedback and insightful reviews. Big thanks to everyone who participated! We’re in the final roll out stages and wanted to give you notice on what to expect. At 12:01am PDT on February 21st, the Forums, Blogs, and Answers will switch to read-only mode until March 2nd, when we launch the new system. This means that everything housed within the http://blogs.secondlife.com site will still be available for you to read, but you cannot post comments--or contribute content--until March 2nd. Why go dark for over a week? Good question. We need the time to make sure that the data set, housed within our current system, is safely ported into the new platform and that everything is fully operational and ready to go for you on launch day. Looking forward to sharing more on launch day and to your contributions to the new platform. As customers, your satisfaction and input is critical to the success of Second Life. However, we know that it has sometimes been confusing and difficult to communicate with us and we can always do a better job of listening. Toward that end, we’ve taken a hard look at all of our Resident-Linden communication paths and designed, or revamped, a series of new programs and tools to help us all have a more productive dialogue. Our goal is not only to listen and acknowledge your feedback and ideas, but also to work more collaboratively to help build a better Second Life experience for the common good. In addition to rolling out new Community Participation Guidelines that apply across all communication paths, we also want to make very clear which ones are best to share your ideas about how to improve the experiences, content, and economy in Second Life, which ones are best to communicate with each other, and which ones to use when you want the latest news on Second Life or Linden Lab. Also, please note that next month we will be rolling out a new community platform--an integrated system that will include SL Blogs, SL Forums, SL Answers, and the Knowledge Base. We will be blogging about that in the coming weeks as we get closer to launch. First, we would like to explain what we are trying to achieve and how we propose to do it. We've updated our guidelines about community participation and they're largely the same, just clarified and streamlined for easy reference. The purpose of these new guidelines is to keep the conversations constructive, courteous, respectful, and in the spirit of collaboration so that we can have more thoughtful and effective discussions. The new Community Participation Guidelines outline the ground rules, in addition to our Terms of Service, for all Resident and Linden communications on the blogs, forums, bug tracker (JIRA), SL Answers, User Groups, and the Knowledge Base. Office Hours Transition into Focused User Groups: The best part about the Office Hours program was direct Linden-Resident communications, but it was often a challenge to find the best Office Hours (or Linden) to give your feedback to. And, the conversations were sometimes not as focused or productive as they could have been. For us, we struggled with the unstructured nature of Office Hours. They were not effective enough in getting the right pieces of feedback to the right people who could act upon it--the Product Managers and teams--or creating a broader, representative sample of what most Residents thought about the topic. Today, we are announcing a new approach--User Groups. User Groups are product or community focused and each one is led by the Linden responsible for the specific topic. The User Group program is about opening up a more representative and focused dialogue about user needs. Most User Groups are public and may include any or all of the following: inworld meetings, JIRA sections, a Twitter feed, an SL Forum, and/or an SL email list. It’s up to the User Group leader and the core Resident team to determine how they best communicate with one another. The discussions should be open, direct, and be more forward-looking and focus more on how we can improve your user experience. A complete list of User Groups, and their Linden owners, is available here on the Second Life wiki and there’s also a Google Calendar where you can see all User Group meetings and add them to your calendar. Many User Groups will have several Linden team members participating, in addition to the User Group leader. All User Group leaders will be publicly posting agendas and notes from each meeting that may include an audio recording or a text chat log. So, whether you are a participant in a specific User Group or not, it will be easy to check in and see what’s going on in any area that you’re interested in. Submit Bug Reports in JIRA: For those that aren’t familiar with JIRA, it is our public bug tracking system and it’s the best place to go to let us know about bugs or suggest new features that are proposed in User Group meetings or outside of those sessions. Our development teams actively review the bugs that you submit in JIRA and do one of several things: place the item onto a development team backlog to address, ask the submitter to contact Support or provide more information if the developer cannot reproduce the bug, or close it and explain why we aren’t going to tackle this particular bug or idea. It’s also important to note that we are going to remove the “voting” feature in JIRA in one month. Today, we do not use voting to triage or to make product decisions and the last thing that we want to do is set false expectations. So, when you are interested in what action we will take on a particular JIRA, use the JIRA “Watch” feature so that you will be immediately updated in email when there are new comments on that particular JIRA issue. We will continue to use the number of Watchers as an indication of the level of interest. Find Solutions SL Answers: If you haven’t explored SL Answers yet, then you definitely should try it. Second Life Answers is the best place to ask questions and get answers from other knowledgeable Second Life Residents. It’s a very helpful tool when you need to have your questions answered quickly. And, if you’re a long time Resident, you should jump in and help answer questions and help out your noobie friends. Participate in SL Forums: SL Forums are a great place to connect with other Residents on specific topics. As I mentioned earlier, we’re going to roll out a new community platform for Forums that is easier to use and more organized. Look for that next month when User Groups will be adding specific areas for lively discussions with our Product Managers on topics relevant to each User Group. Join the SL Email Lists: Late last year, we cleaned up the old SL email lists and created a few new ones to accommodate discussions happening among smaller communities that may not have any other way of connecting--ranging from the open source community to the educators in Second Life. The lists are a great resource to use when you want to tap into the collective wisdom of a group. Take a look at the current SL email lists that are available and join the ones that most interest you. If you would like to suggest a new list, then just email me (address below) or drop me a note card (SL: Amanda Linden). Check out the SL Blogs to Get Second Life and Linden Lab News: The SL Blogs are always the best place to go for news and information about Second Life. As is true with Forums, we’ll be rolling out a new Blog structure next month--and be blogging about it shortly. So, stay tuned! Follow Us on Twitter: Twitter is a great way to get the latest and greatest information about Linden Lab and Second Life. There are many lists to choose from and we encourage you to follow us and join the conversation. 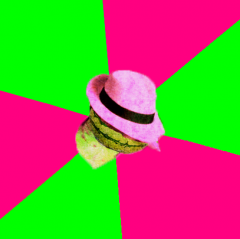 The primary Twitter account to follow, if you want immediate notices of blog posts and other news, is @SecondLife. For a complete list of official Linden Lab/Second Life Twitter feeds, click here. This page will constantly be updated, so check back often. We also actively follow these hashtags: #sl, #secondlife, #slviewer2, #slmarketplace and suggest that you do, too. Like Us on Facebook: Facebook is the best place to find out about cool things going on in Second Life, share ideas, and get the inside scoop on inworld events, contests, machinima releases, PR activities, fun discussions, and more. Come join over 111,000 people who have “Liked” our Second Life Facebook page. Of course, these communication programs are evolving, and we look forward to your feedback on these changes and other suggestions on how we can continue to improve our community communication programs. Feel free to leave comments here or email me at amanda at lindenlab dot com. As you may have already heard, HBO will be showing a documentary called, When Strangers Click: Five Stories from the Internet on February 14 (Valentine’s Day). The film is the work of Robert Kenner (the Oscar®-nominated director of the documentary Food, Inc.), and it presents several stories of people finding love online. One of the segments of the film is a great Second Life love story: a talented musician happened to meet a woman at an inworld performance, and as a result, both of their lives have changed significantly. Watching the film, it’s clear Robert Kenner ‘gets’ Second Life, and in addition to telling his subjects’ stories with compassion, he realistically presents the virtual world and its possibilities. If you’re an HBO subscriber, I highly recommend checking this one out. For details and the trailer, see this page on the HBO Documentary Films website. If you’re not a subscriber, keep an eye on the film’s Facebook page for the DVD release date. On February 6, Tonight Live with Paisley Beebe will have both Robert Kenner and Bara Jonson, the musician featured in the film, on the program. Paisley will interview Robert, and Bara will perform live. For details, check out Paisley’s announcement here. Over the years, many of you have shared your own stories about making meaningful connections with others in Second Life – and now, the filmmakers would love to hear them as well. If you have a story about meeting someone in Second Life that deeply affected you (it doesn’t need to be a romantic connection), add it to the film’s Facebook page – and while you’re there, click ‘Like’ to show your support! 2010 ended on a positive note for the Second Life economy, with several key measures growing while others remained stable as compared to Q3 numbers. Total money supply, LindeX volume, and web merchandise sales volume were all up between 6% and 8%, indicating growth in economic activity. Also, the L$ rebounded strongly from Q3, appreciating 3.7% quarter to quarter. When comparing 2009 to 2010 measures, average monthly repeat log-ins were up 8%, average monthly economic participants were up 4.3%, annual web merchandise sales volume was up 104%, and the world size grew by 5.8%. For a definition of the metrics in this post, please see this wiki page. Click on each image below to see a larger version. Repeat logins gained 1% this quarter. 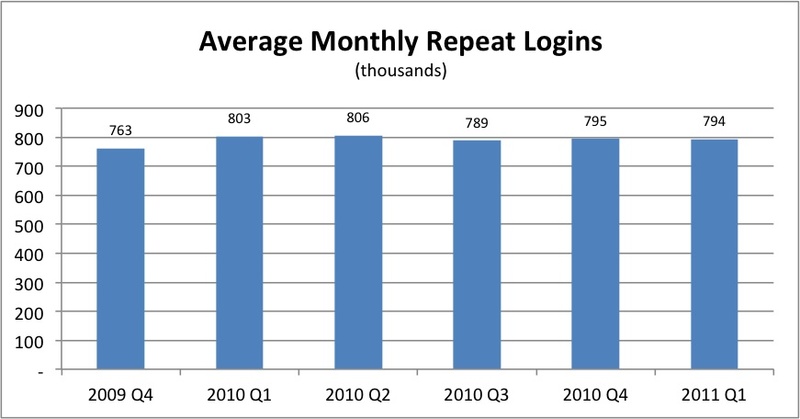 Average monthly repeat logins in 2010 rose 8% over the 2009 average. User hours were flat this quarter, appearing to stabilize after a gradual decline in the prior four quarters. 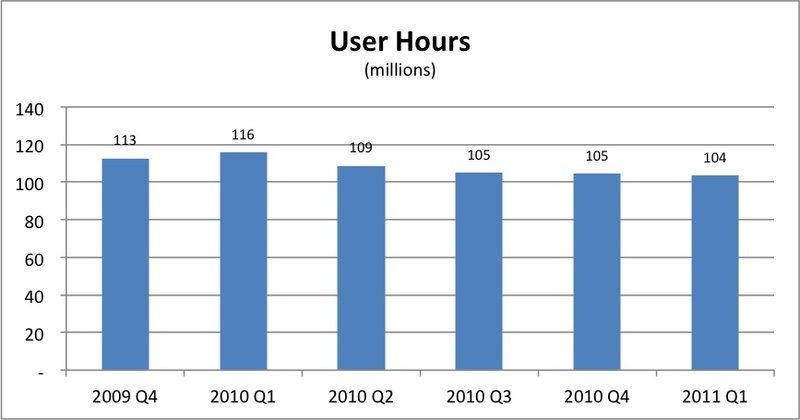 Total user hours in 2010 fell 10% from 2009. Economic participants were flat in Q4, remaining in the historical five-quarter range. Year over year, the 2010 average of monthly economic participants was up 4% from 2009’s average. Increasing demand and falling supply on the LindeX caused a 3.7% appreciation in the value of the L$ in Q4. * The average L$ value in 2010 was within 1% of the average value in 2009. 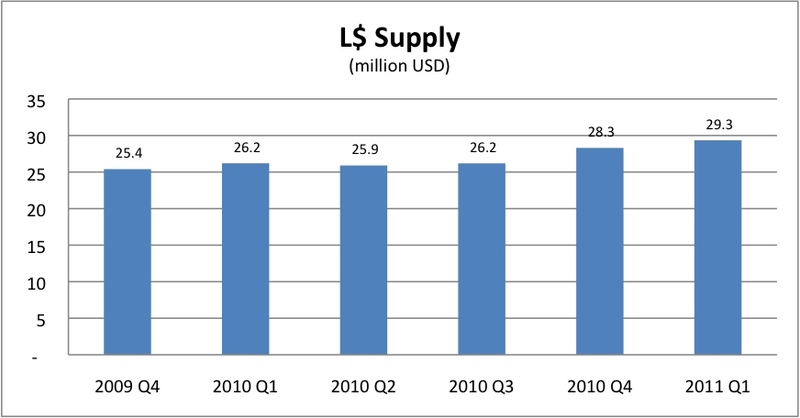 Money supply grew significantly in Q4 to US$28.4m worth of L$, 8% over Q3. The year end money supply in 2010 was 11.9% over 2009. Mirroring money supply growth, volume on the LindeX grew 8% in Q4, nearing the top end of the historical five-quarter range. Total LindeX volume in 2010 was nearly US$119m, 2.8% over 2009. This means that an additional US$4m traded hands on the LindeX in 2010. Driven by greater merchant adoption and improved shopping features, web merchandise sales volume grew 5.8% in Q4. 2010 web sales volume was up 104% relative to 2009. 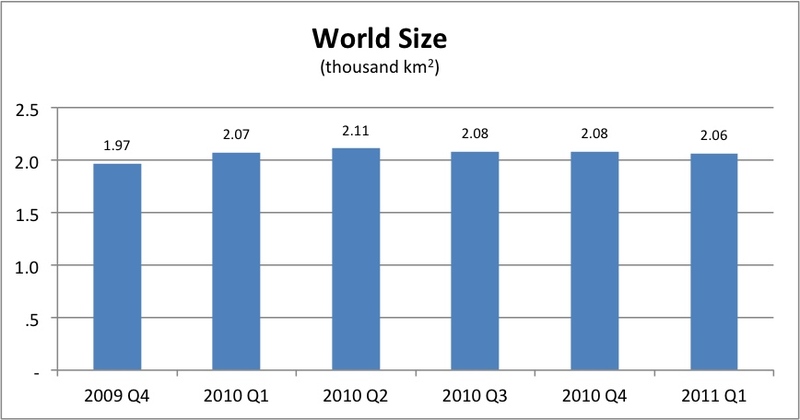 World size remained flat in Q4; 2010 year end world size was up 5.8% relative to 2009. Today, Second Life's virtual land mass would be roughly twice the size of Hong Kong. Firstly, thank you all for your kind words of welcome. It has been an unexpected delight to receive goodwill messages from so many Residents. I also appreciate the many thoughtful comments on BK Linden’s blog post announcing my appointment. I have read them and will be addressing some of your questions as soon as I’m a bit more settled in. One of my highest priorities, over the last few weeks, was spending as much time as possible exploring inworld (with an alt and now Rodvik Linden) to better understand the product experience, your needs, and the culture of Second Life. I have discovered so much. I am amazed on a daily basis by what you have created. Over the holidays, I enjoyed many winter landscapes and seasonal activities. And, more recently, I have been playing around with vehicles and animals. Next, I wanted to see how the scripting system worked. So, I made myself a “mail post” that emailed me. I was very impressed by how easy it was to get up and running. Having no shelter on my island seemed a bit odd. So, I built myself a shack. It doesn't look like much, but it’s home. Getting immersed in Second Life is the fun part of the job and I can see why you love the world that you’ve created. I’m in the process of getting up to speed and working with the team to finalize our plans for 2011. I hope to start sharing more in coming weeks. Until then, thank you again for such a warm welcome and please follow me on Twitter @rodvik. I look forward to serving you--our customers--in the times ahead. I’m happy to announce some very exciting news today: Rod Humble is Linden Lab’s new CEO. Our press release is here. You’ll hear from Rod himself after he starts in mid-January, but in the meantime, we wanted to share a brief introduction. Rod has an impressive depth of experience in developing and leading fun, immersive entertainment experiences that have been great successes. As a 20-year veteran of game development, he’s worked on more than 200 games, and last year, the gaming magazine Edge named him #2 on their annual list of Hot 100 Game Developers. Rod is coming to Linden Lab from Electronic Arts, where he was Executive Vice President and led EA Play, including the best-selling PC game franchise of all time, The Sims. Prior to EA, he was a VP of Product Development at Sony Online Entertainment, where he led the EverQuest Studio. Rod has a deep appreciation for what makes Second Life special. He’s already been exploring and experimenting inworld to familiarize himself with the pluses and minuses of our product and the successes and challenges faced by our Residents. He’ll officially start at the Lab in mid-January, and I’m excited for us to begin 2011 with fresh perspective, renewed energy, and creativity. Happy holidays to you all from Linden Lab! We wish everyone a very happy and prosperous new year -- it’s going to be a great one for Second Life! Rod Humble is Chief Executive Officer at Linden Lab, and he leads the company’s strategy and the development of Second Life. Humble’s 20-year career in the game development industry has included work on more than 200 games. He joined Linden Lab from Electronic Arts, where, in his role as Executive Vice President, he led the EA Play label, which includes the best-selling PC game franchise of all time, The Sims. In 2009, he was ranked #2 on the annual list of the Hot 100 Game Developers from gaming publication Edge. Prior to his work at Electronic Arts, Humble served as Vice President of Product Development at Sony Online Entertainment for the massively multiplayer online game (MMOG) EverQuest. I’m delighted to announce that today we have released Viewer 2.3 as the main Second Life Viewer and the default download for new Residents. This release includes the full launch of Display Names allowing greater self-expression, improved Event Scheduling, Viewer Hints, and many additional performance and usability enhancements. For more information on the new features, see our Viewer 2.3 Beta blog post. This is just a few short weeks from when the Viewer 2.3 Beta was made available; a big thanks to those Residents that downloaded the beta and provided feedback. Download the Viewer 2.3 Release today, try it out, and Twitter your thoughts using the #slviewer2 hashtag.And, if want to learn more about Display Names, then there are plenty of places to find information including some excellent videos by Torley. Check out the helpful links below. Please note: If you are using an older version of the Viewer (including most 3rd party Viewers) that still has three login fields (first name, last name and password), please read this page for guidance on how Display Names affects logging in. As we explore ways to make the Second Life experience faster, easier, and more fun, we are testing a number of approaches to bring new users closer to the richness of our virtual world. Yesterday, we quietly launched a beta test of a new technology that opens up Second Life to new users like never before: Second Life on the Web! The SL Web Viewer allows new users to become Second Life “guests” through the Web and enjoy basic SL functionality while exploring exciting destinations in Second Life -- all without downloading a Viewer. We need your help to test the SL Web Viewer! Just click http://interest.secondlife.com/beta to check it out. There is a 45-second video that will run while the system loads and then you’ll either be offered an “Explore Now” button -- which means that you have successfully qualified -- or a “Join Now” button -- which means that you do not qualify for the test at this time*. If you qualify, you’ll be asked to share your email address to create a temporary guest account to use the SL Web Viewer. We’ll be running tests like this from time to time, and we may ultimately choose to further pursue some or none of these approaches, depending on what we learn from our testing, but we’re very excited to make SL an easier experience for guests and look forward to hearing what you think. *Note: We’re in the early stages of testing this technology, and not everyone who navigates to the link will be able to access the SL Web Viewer. The Second Life Discussion Guidelines have moved here. ^ As a friendly reminder, please read the guidelines before commenting on the blogs or posting in the forums so you can be awesome! This change was done by Torley Linden as part of making help easier to find... because the previous version couldn't be read by non-logged-in Residents and contained numerous formatting glitches and old references (for example, "Xstreet" instead of "Marketplace"). The meat and spirit of the Discussion Guidelines' content remains the same, and been cleaned up on the wiki help pages, where future versions can be updated easier. Please let Torley know if there are further errors to correct. The Second Life economy continues to be steady, with nearly all key measures staying within a narrow range of just a few percentage points up or down over the last year. The largest changes compared to last year's Q3 were an increase of 7.2% in World Size, a decline of 11% in User Hours, and a 115% increase in Web Merchandise Sales Volume. Over the last year, the number of people participating in the economy has also been consistent, ranging from 480,000 to 496,000 (currently 486,000), as has L$ Supply, which has ranged from US$25.4 million to US$26.2 million, and was at a 12-month high in Q3. Average Monthly Repeat Logins fell 2.1% from Q2 but still rose 5.3% year over year. User Hours fell 3.7% from Q2 and 11.0% year over year. The most significant quarter-to-quarter loss of user hours was from the heaviest usage segment (accounts logging over 300 hours per month). Active economic participants fell 1.0% from Q2 and year over year. As expected from the fluctuations in June, the average exchange rate of L$ per US$ rose 1.7% from Q2, or 2.5% year over year. 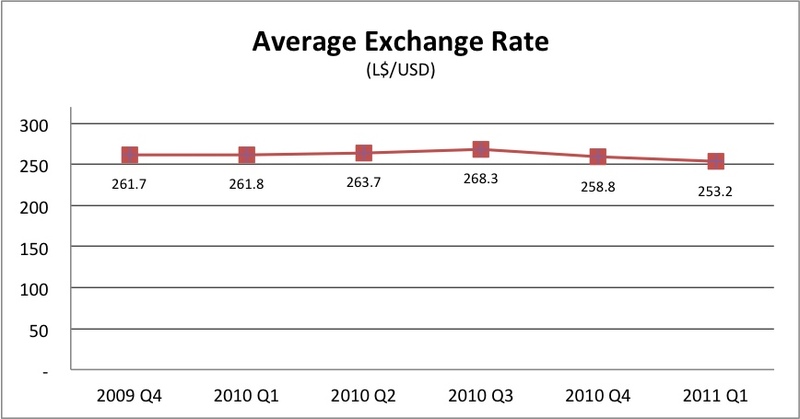 Note that a rise in the L$ exchange rate represents a drop in the value of the L$, as one US$ now buys more L$ than it did last quarter. The equivalent US$ value of all Resident-held L$ grew 1.2% from Q2, or 6.1% year over year. Although there may have been fewer economically active accounts in Q3, this suggests the L$ in those accounts did not exit Second Life. LindeX volume in Q3 fell 3.8% from Q2 and 2.8% from Q3 2009. With fewer economic participants, there was less need to replenish L$ balances from the LindeX. Total sales volume on both Xstreet SL and the new SL Marketplace rose 8.5% from Q2 and grew 115.2% year over year. Note that the SL Marketplace was only in beta during Q3 and makes up less than 10% of total Q3 Web volume. Total world size fell 1.4% from Q2 and grew 7.2% year over year.